Choice of equipment: An electric outboard was preferred because compared to a petrol outboard they are: quiet, light and small (easy to transfer to the inflatable), and supposedly more reliable and easy to maintain. 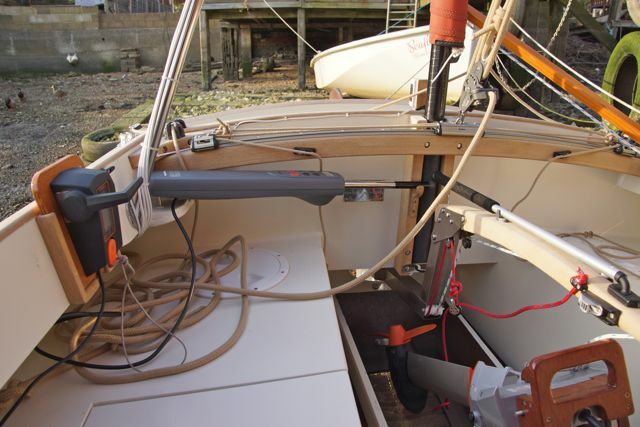 I already owned a Torqeedo 1003 which is claimed to be equivalent to a 3 to 4 hp petrol outboard and be suitable for powering day sailers up to 1.5 tons. Larger outboards such as the Torqeedo Cruise 2 are prohibitively expensive (including battery, around £5000). Most other makes of electric motors do not claim as much power. Installation: To fit in the outboard well, the effective shaft length had to be shortened by 5 cm by sliding the stainless motor shaft up in the mounting bracket and shortening the fairing by a similar length. I have described this in detail on the Swallow Boats Association web site. The Lithium-ion battery was situated in the cockpit locker and connected to the motor by a Torqeedo 1920-00 extension cable. 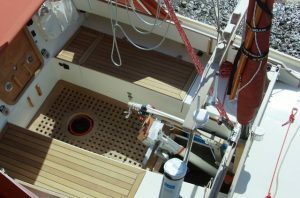 The battery would be recharged in situ so in case of over-heating (a very small but potentially catastrophic risk), a smoke detector and a fire extinguisher were mounted in the cockpit locker and a fire blanket fixed just inside the companionway. The Torqeedo battery charging socket was connected to the 12V supply via a dedicated 2 core cable from the switch panel (current is about 3A). A Torqeedo 1918-00 remote throttle unit with extension cable was fixed to a plywood mount which could be slotted into brackets fixed at various positions in the cockpit. For normal use the motor steering was locked and the boat rudder used for steering. I made a wooden handle to fit where the battery would be to help in lifting or steering the motor. The remote throttle and the lifting handle can be seen in the photo. In Use (good points! ): Compared to a petrol outboard the Torqeedo is very quiet (although the gear box whine can get on ones nerves) and, even when raised, takes up little space in the cockpit. Provided one stayed at around 2 to 3 knots it could take Seatern down the river to Southampton Water, and then be recharged from the 12V supply during a day’s sailing. Thus I’d have almost a full battery for the return up the river. I have used the Torqeedo on my inflatable and, although I haven’t done it, it would be a practical option to transfer it from Seatern to the dinghy while at anchor. Finally, the weight of the motor, and batteries is distributed lower down and more central in the hull compared to a petrol outboard. Limitations of power, thrust, and range. Despite my hopes, I gave up using the Torqeedo because these factors were significantly restricting my use of Seatern. Power: At full power the battery is depleted in around than 30 minutes and even at the maximum allowable recharging rate (perhaps 120W) the 530Wh battery would need a few hours to be recharged. But the only reason I would want to use full power would be if struggling to make way against adverse wind and/or current. That implies that Seatern would be making very slow progress, and in 30 minutes I would not get very far. A situation could rapidly develop where one no longer had any power available to drive the boat. What’s more, even if full power is only used for a short time, the range subsequently available at a lower power is severely shortened. In practice, this means that the full power of the Torqeedo is not really usable and the motor is really only equivalent to perhaps a 2hp outboard. Thrust: When I have used the motor in strong winds on my Seafly dinghy, it appears to lack thrust. At full power in calm conditions it can push the racing dinghy at 6 kt which is nearly planing speed. But in high winds it fights to keep the boat on course. For Seatern, even in calm conditions full power only achieves just over 4 kts. I interpret this as lack of thrust. I don’t understand the propeller specifications quoted by Torqeedo, but those for the 1003 propeller seem to be more similar to those for the alternative propeller sold for their larger “Cruise” motors for “planing applications with lighter boats“. To my mind this lack of thrust compounds the lack of power problem and made me reluctant to take Seatern out if I may have to contend with strong winds while under motor. Range: Say I decide to sail to the Isle of Wight and the wind drops, to motor back that distance with the Torqeedo I’m going to be limited to around 2.5 knots and likely to be fighting a 1 knot current. It will take me a long time and I will miss the tide and not be able to get to the jetty until the next tide. In tidal waters the Torqeedo does not have a long enough range at a practical speed for me to contemplate a passage under motor. It is not totally reliable – it can occasionally stop with the screen displaying an error code (for example during rapid throttle changes, or if the propeller fouls something). The control needs to be switched off and on again to cancel the error. I also had trouble with the propeller shear pin and washers (see diary entries for 3rd to 5th May 2014). The two bladed propeller is soft plastic and easily damaged (for example by contact with the outboard well laminae, or the metal part of the tiller knee). It tends to jamb across the outboard well opening when raising the outboard. The remote throttle is designed to be mounted horizontally. Mounted vertically it is hard to read the display unless you mount it upside down. But with the throttle upside down I tend to push it the wrong way in moments of panic! Conclusions: Used on a BC20 the Torqeedo 1003 is probably OK if you can manage with something like a 2 hp outboard. Probably OK on a lake but severely limiting in tidal waters. The limitations of the Lithium-ion battery and design of the motor/propeller unit are such that the full power quoted is not in practice a reality. An implication is that some of the larger electric trolling motors which are now available (for example the Mariner Varimax FWV55HT) in practice may offer similar performance to that available from the Torqeedo but at less expense. They also have the advantage of using a 12V power supply. However I have not tried that option and it must be remembered that the rate of discharge required to power those motors (several tens of amps) will significantly reduce the available capacity of standard 12V lead acid batteries. 12V Lithium Iron Phosphate batteries might be a better choice. N.B. The opinions expressed are my own and relate to my own requirements; there may be ways around some problems identified. Other users will have different priorities from me!